One of the techniques to use for magical self defense or protection magic for your home is the warding and binding of the mirrors in your home environment. This is just one of the helpful techniques you will find in our How to Do Voodoo ebook. In protecting your home, you can put up omnils or various types of shields, but did you know that mirrors can be magical windows or doorways into other worlds and a way others can by-pass your shields and get into your space? Look around your home and I bet you will find many silver and/or black mirrors. Besides what we usually think of as a mirror, there are reflective surfaces such as computer screens, TV screens, and reflective glass of kitchen appliances such as microwaves. Really look around your house and see what types of reflective surfaces are there. Mirrors are like psychic sponges. They absorb all types of emotional energy as well as create access for other worlds. Unless you know how to program a mirror like a magician or shaman does to use it as a tool, then you don't know what the mirror is accessing at any given time. This can be a danger in that you never know who or what may enter your space through these magic portals. 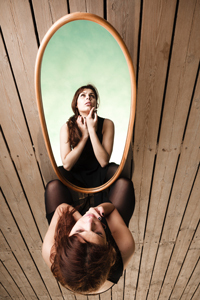 Black mirrors are also sometimes referred to as witch's mirrors. Magicians and shamans make their own black mirrors as a tool for doing things such as traveling to other realms. They are trained in how to program the mirror and use it for divination and research. In a like manner a magician or shaman can use our own mirrors to enter our worlds and penetrate our shields. So even if you have an omnil or other protective shield around your home and then have a mirror that reflects a scene that is outside the shield, your space can be entered through this portal. Silver mirrors are only able to access the level or plane you see in the reflection. Black mirrors however can access any realm. Unwanted spirits can also be found residing in mirrors. 1. First do a 4 element cleansing on your mirror (or do all your mirrors at the same time) using your Firebowl and Chalice. If you are not familiar with how to do a 4 element cleansing see the directions HERE. 2. Load your Athame (Fire element tool) with the electric blue color of the Fire element, and sweep the mirror from top to bottom with a sheet of this energy. 3. Then ward the mirror by putting the Left Eye of Horus symbol in the lower right hand corner of the mirror. You can either draw it on with a permanent marker or get a permanent sticker to put on the mirror. 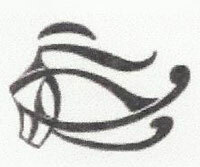 See the picture below of the Left Eye and be sure you use that one and not the Right Eye of Horus. The Right Eye enhances spirit vision and divination. It is used for seeking, opening and pulling, all of which are the opposite of protection magic. The Left Eye is a natural mirror and glass protector. If your mirror is round or oval shaped, then put the Eye in the bottom center of the mirror. 4. Now bind the mirror by again loading your Athame with electric blue, extending a beam of this energy off the tip and drawing an X with it across the mirror. When drawing the first line of the X, go from top right to bottom left. For the second line of the X, draw the line from top left to lower right. When drawing each line lock the beams into the frame or back of the mirror at corners. 5. If you ever need to unbind your mirror, just use a beam of electric blue from your Athame and cut down the center of the X with a vertical or horizontal cut. Use this simple protection magic technique to keep your sacred space clean of unwanted energies, archetypes, and spirits and as a self defense tactic against others that would invade your space to bring you harm. Whereas mirrors, especially black mirrors can be a useful tool when properly used, they can also be used against you. Warding and binding both your silver and black mirrors can give you peace of mind that your home is protected from any of these outside invaders. Is Your Magical Practice at Risk?